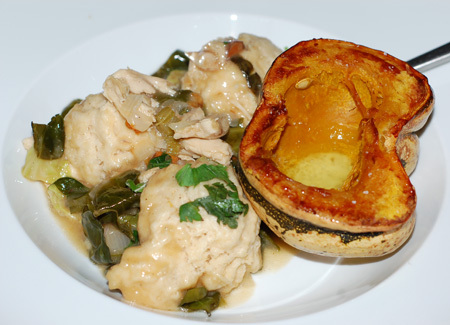 Winter squash may be one of my least favorite foods: a flavor like sweet potato with a more watery, stringy texture. The hard rinds and slimy tangle of seeds inside make even preparing them a sensory frustration. Which is why I went around the farmer’s market this month, gathering up one of nearly every variety of squash I could find, within reason—some winter squashes are so large that it would take us all winter to eat them up! 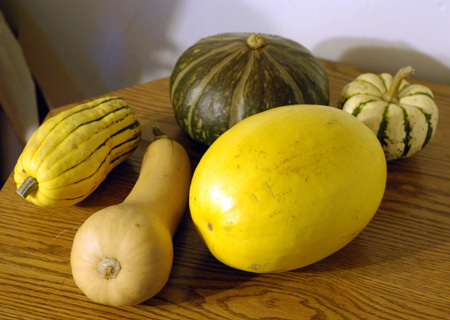 Shown here, clockwise from left: delicata, hokkaido blue (possibly cross-pollinated), sweet dumpling, spaghetti, and butternut. There was also an acorn squash already lurking in the basement that did not make the family photo. The sweet dumpling squashes were Nolan’s favorite to hold, probably because they are nicely toddler-sized. They were surprisingly tough little things—I needed Jeremy’s help to slice this one in half. Then I roasted them cut-side down at 400F for about half an hour, until they were tender. As you can see, I couldn’t resist serving these with actual dumplings, courtesy some leftover roasted chicken. Once they were ready, I filled them with pats of butter, tiny drizzles of maple syrup and sherry vinegar, and a pinch of salt, an homage to the roasted acorn squash my mom used to make, their hollows filled with melted butter and brown sugar. Jeremy scarfed his half down, commenting repeated about how he couldn’t stop eating it. I forced myself to take three bites and handed over the rest, and for some reason, Jeremy agreed that my half of the squash didn’t taste as good as his. I have no idea what that is about, but we have one more of these things to eat, maybe stuffed with some combination of meat and grains, so I’ll withhold judgment for now. Our second squash encounter was in the form of everyone’s favorite comfort food, macaroni and cheese. If you look up butternut macaroni and cheese, chances are you will find a lot of references to Jessica Seinfeld’s book, Deceptively Delicious, and its potential plagiarism of one that was published earlier the same year called The Sneaky Chef. I haven’t read either book, but honestly, most of the recipes I’ve seen floating around from each of them are nothing particularly original, just purees hidden in familiar foods. As a picky eater myself, I am generally very opposed to this sort of practice, because I believe picky eaters need to be fully aware of what they are eating. Yes, you may be able to trick them into eating healthier meals, but they will never come to terms with the objectionable ingredient unless they realize they are enjoying eating it. If that had been done to me, it would have actually made me more suspicious of all my food! 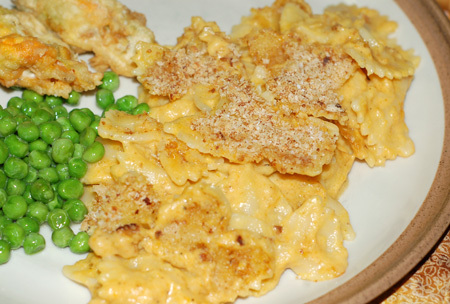 So, after that tirade, why in the world would I make butternut squash mac and cheese? Because as an adult picky eater, I will admit that there are times when I need to try to trick myself into eating new foods. The difference is that I am the one doing all the cooking, and I can control how much squash goes into the dish. Using a puree really can ease your palate into an unpleasant food, and butternut squash, with its creamy texture, mild flavor and cheesy color, can easily blend into a mornay sauce without really making its presence known. My whole family liked this dish: My toddler ate quite a bit (he’s in a fussy stage right now, but being the strong silent type, we don’t always know if he is rejecting the actual food or just asserting independence), and I enjoyed it enough to go back for seconds. I can see myself working up to the flavor of pure squash by progressively adding more puree and less cheese, to eventually end up with a butternut pasta sauce merely garnished with Parmesan or Gruyere; from there you could leap to creamy soups, souffles, squash-filled raviolis, savory bread puddings (a.k.a. stuffing) with caramelized chunks of squash, and so forth and so on. So yes, make this for—or better yet, with—your squash-hating picky eaters, and let them know what it is so that they can make an informed judgment. They might surprise you if you let them. The original recipe calls for a crumb crust of gingersnaps and pecans, which takes the dish too far in the direction of “Squash!! !” for me, at least currently. Use your own discretion. Also, be aware that the type of cheeses you choose to use can, if desired, overpower the flavor of the butternut squash. Do lots of tasting to find the right balance for your palate! Preheat the oven to 450°F. Toss the squash cubes with olive oil, salt and pepper to season. Roast on a foil-lined baking sheet for 20-25 minutes until lightly browned. Set aside and turn the oven down to 350 degrees. Bring a large pot of salted water to a boil. Add macaroni and cook until al dente according to the package instructions, about 8 minutes. While the pasta cooks, heat a large pan over medium heat. Add the butter, chopped onion, garlic, and sage. Saute about 4-5 minutes until onions are translucent. Add the flour and stir to combine. Let the mixture cook for 1-2 more minutes. Whisk in stock and milk, and let come to a boil to thicken up. Turn the heat down to low. Add about half the squash cubes and use an immersion blender to puree completely. Next, add the cheeses, mustard, Worcestershire, nutmeg, and paprika. Stir until melted and uniform; do not boil! Taste the sauce at this point, and adjust seasonings. If you think you can handle more squash flavor, add more cubes and either puree them in with the immersion blender or use a potato masher or whisk to smash them up into chunky bits. Drain the cooked pasta and return it to the pot. Pour the sauce over the pasta and combine well. Pour into a buttered casserole dish. Sprinkle with your crumb topping of choice (I use frozen homemade bread crumbs seasoned with salt, pepper, and garlic powder, drizzled with a little olive oil). Bake until bubbly and lightly browned on top, about 30 minutes. (If you use gingersnaps, you may want to cover the dish for the majority of the cook time to prevent burning.) Allow to settle for several minutes before serving. Source: Adapted from Lick My Spoon. More squash recipes to come, clearly!